Сноуборд Nitro Mountain M (2017) Купить в Минске. It's quite simple, the Nitro Mountain Snowboard was made for the mountain, and the mountain was made for the Nitro Mountain Snowboard. It's All Terrain flex keeps you in control with enough pop to make every day incredibly enlightened, while the progressive sidecut and Tapered Directional shape keep you firmly in control on steep, dicey terrain. The Powercore II was crafted for both incredible strength and durability, while also remaining light and agile. All in all, the NitroMountain Snowboard will not let you, or the big snow covered land mass you ride around on, down. 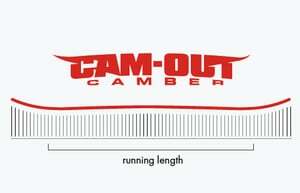 Cam-Out Camber – Nitro's Cam-Out Camber is basically a classic camber shape with early and smooth transitions into Tip and Tail. The result is a fun and responsive board that turns on the spot and is forgiving, even after that 713.5° landing! All-Terrain Flex – Nitro's most versatile flex, pattern, combining Nitro's signature pop with smooth response, allowing you to tear up the entire mountain. Progressive Sidecut – A larger radius in the front, blended into a tighter one towards the tail: The progressive sidecut makes accelerating out of turns a breeze, while maintaining a catch-free nose area. Powercore II – The Powercore II is a tip-to-tail poplar wood core with additional beech wood stringers for unrivaled strength, smooth response and insane snap. Sintered Speed Formula HD Base – Utilizing a new base material compound, we have been able to achieve higher abrasion resistance, increased wax absorption and higher on-snow speeds.